They’re beyond dreadful. Flat and offering less support than Chad Morgan opening for Metallica. The Dunlop Volley is a cultural icon, but podiatric nightmare, and I often wonder how Ken Rosewell wore them and still won all those tennis matches? But spotting them about, they’re like the rarely seen old mate banging on your door with a six pack of Coopers. House painters love them. The herringbone tread must be superb if your day involves leaping up and down ladders, and cutting in around annoyingly ornate ceiling features. They were also great as we plodded off to fourth year English, cruelly scheduled on Mondays from 4 – 8pm. At 8.01pm I’d point my HQ Holden southward, and with my old friend Jonesy co-piloting, navigate speedily if not unlawfully to the Botanic Hotel where we’d review the lecture’s major themes, or not. But I couldn’t wear Volleys for sport. On the cricket oval I was a Puma Barbados man, and everything else apart from footy was handled by my Adidas Romes. “Town.” Adelaide was rarely called Adelaide. And I’m sure it did. Over the decades I’d imagine Peter in his shed, pulling down a box of new but peculiarly aged Volleys, brushing aside any resident Daddy Long Legs spiders, and with impish delight, sliding on the Dunlops for spring’s first cricket training. But six pairs! What a visionary. Succession planning of the utmost order. Cricket Australia: phone this fella now. I had mine on last Friday when the boys and I were at the park kicking their new Sherrin. They (the shoes, not the boys) are still terrible for this. However, as I later sizzled some sausages on the park’s free barbeque they became magnificent. My tong work was sublime, and I’ve rarely squirted sauce with such crisp authority. I thank my Volleys. They were always more Dean Martin than Dusty Martin. They’d doubled in price. 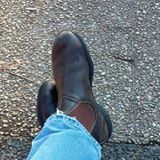 This was much better than anticipated, but I did purchase my first pair of Blundstones from a rural supplies store in Kimba during 1993 for fifty bucks. Since then we’ve moved nine times across three countries, and they’re still travelling superbly, and remain as utilitarian as Mark Ricciuto, but with a mellifluous special comments voice. A new job meant I had to buy some new footwear so I jumped on the tram to revitalised Adelaide menswear retailer, Trims. Where previously I had no choice there are now multiple styles of Blundstones, catering from bushie to micro-brewing hipster. It was like buying a newspaper in London. You glance at the dozen or so front pages. The Times. The Daily Express. The Independent. And then, having scanned the alternatives, you buy the one you always get. On the tram home I thought about my new boots and me. What might the next twenty-two years bring? I know it’s feeble, but sometimes you just surrender. To make life easier. In Singapore, and surrounded by Americans, Canadians and Brits I started calling them flip-flops. It was just simpler. And now back home among the throng, and with spring making a few tentative squeaks, I’m reclaiming the word thong. Late Saturday evening my wife’s Grandpop passed away. He was ninety. Not knowing either of my grandfathers contributed to him becoming a significant figure. For most of the twenty years I knew him he and grandma lived in Gympie on the highest hill in town. We’d sit on their front veranda in the thick air, noisy with eccentric tropical bugs and their assorted clickings and whirrings. Geckos would scamper up and down the walls, while I’d gaze down across the houses on stilts and valleys so different from my dusty home town thousands of kilometres to the empty south. With the exception of our wedding I only ever saw Grandpop’s gnarly hooves in slippers. Or barefoot. A magazine columnist once described the non-Queensland parts of our nation as being, “the shoe-wearing states.” Grandpop reinforced this. His slippers were comfortable, but he also went shoeless partly because he didn’t care what those, “bloody wombats” thought. He’d always pronounce wombats with a deliberately long vowel and make it woombats. In the extended family it’s a term of fun and gentle mocking. Mostly. And now he’s gone. He lived long, but it’s still sad. The boys and I will continue to be bedazzled by Patrick Dangerfield’s seemingly irradiated footy boots. 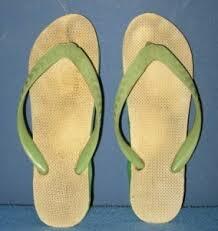 Before the season’s first lawn-mowing I’ll buy a pair of thongs, some double-pluggers. For extra comfort and backyard safety. Like a feisty yearling my new Blundstones will finally be broken in, and the Volleys, as always, will push me on into that bright, windy spring.